Egypt’s former President Hosni Mubarak, hospitalised since April and due to stand trial in August, is in a coma, his lawyer said on Sunday, although the state news agency MENA cited a hospital official as denying the report. “Mubarak suffered a sudden loss of blood pressure but quickly returned to normal again after the necessary medicines were given to him. His medical condition is stable,” MENA quoted the official as saying. 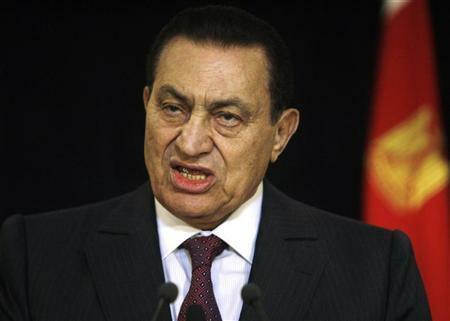 Another medical source told Reuters that Mubarak, 83, occasionally slipped into a coma but his condition was stable. Mubarak’s condition has been subject to frequent speculation in the Egyptian media, gaining momentum before his August 3 trial. Protesters have been camped out in Cairo’s Tahrir Square since July 8 and have protested in other Egyptian cities. Their demands have included calls for the military council now ruling Egypt to speed up Mubarak’s trial. The former president, who is hospitalised in the Red Sea resort of Sharm el-Sheikh, faces charges of abuse of power and killing protesters. More than 840 died in the 18 days of demonstrations that led to his ouster on February 11. “I was informed about the sudden deterioration in Mubarak’s health and I am now on my way to Sharm el-Sheikh. All that I know so far is that the president is in a full coma,” Mubarak’s lawyer Farid el-Deeb told Reuters. He did not give more details. Deeb said in June Mubarak was suffering from cancer, although a government minister later appeared to play down that report. Some Egyptians have questioned Mubarak’s illness, seeing it as a ploy for the army to avoid putting on trial the decorated former air force commander who ruled Egypt for 30 years. “The news that comes every now and then about him being in bad condition is designed to gain people’s sympathy, especially now with the public demanding he comes to a jail in Cairo and face trial in Cairo, not in his hospital,” political analyst and activist Hassan Nafaa said. Mubarak had generally enjoyed good health in office. He underwent gallbladder surgery in Germany in March 2010 but he had appeared to make a full recovery. When in office, officials routinely dismissed talk of ill health including cancer reports.